Garden of Aaron: Lotsa Balloons! 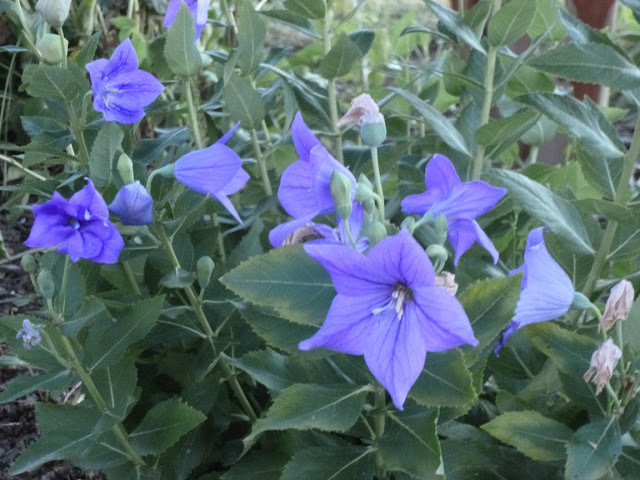 The balloon flowers (Platycodon grandiflorus) are reblooming! In my experience, balloon flowers bloom for months (pretty much all of June and July this year, I think) and if you deadhead them consistently, they'll bloom well into autumn. Now that's a long bloom season! Deadheading is not my favorite garden activity, but I think I'm willing to make an exception for balloon flowers because they are otherwise such cheery, tough, carefree, long-lived plants. And while I rarely saw any pollinators visiting the balloon flowers in prior years, I've seen quite a few pollinators of all shapes and sizes visiting the balloon flowers this year now that the original clumps have gotten larger and the balloon flowers have even self-sowed a bit here and there. PS - Sign up for a free email subscription to make sure you don't miss out on balloons or any other charming flowers!